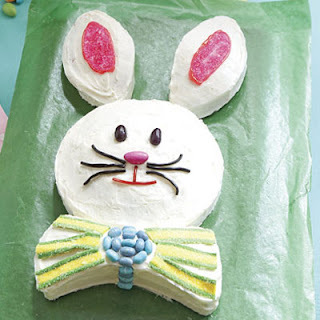 Too-Cute Egg, Chick, and Bunny Desserts ~ Get creative with these fun ideas for easy Easter snacks, including cakes, cupcakes, tarts, and other sweets in festive Easter shapes! Stir in cereal until it is completely coated with marshmallow mixture. Mist hands generously with cooking spray. Shape cereal mixture into 15 to 20 ovals (work quickly while mixture is still warm and soft). If you like, press M&M’s into eggs to make stripes or polka dots. Cool completely. Wrap in cellophane or store in an airtight container. Directions: Preheat oven to 350 degrees. Spread coconut on a rimmed baking sheet; bake until light brown, 8 to 10 minutes, rotating pan once. Set aside to cool. Lightly frost cupcakes with 1 cup Chocolate Buttercream; set aside. Tint 2 tablespoons reserved buttercream pale yellow; place in a pastry bag fitted with a #349 Ateco leaf tip; set aside. Tint remaining buttercream light blue; place in a pastry bag fitted with a #11 Ateco plain round tip, and pipe three bluebird heads, 3/4 inch in diameter, onto each cupcake. Using leaf tip, pipe yellow beaks. With a toothpick, add melted-chocolate eyes. 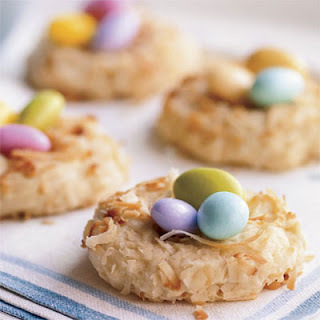 Form each nest with 2 tablespoons toasted coconut. Directions: You'll need baking sheets and a 6-in. 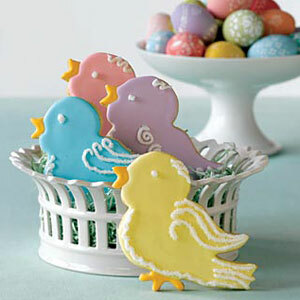 bird cookie cutter. Pulse almonds in food processor until finely chopped. Add flour; process until almonds are finely ground. Add butter; pulse until crumbs form. Add sugar, egg and 1 1/2 tsp extract. Process just until dough forms. Pat dough into a ball; divide in half. Place one half between 2 sheets of wax paper on a dampened work surface; roll out to 1/4 in. thick. Repeat with other half. Slide onto a baking sheet; place in freezer about 10 minutes. Heat oven to 350ºF. Remove top sheet of wax paper. With floured cutter, cut out as many birds as possible. With metal spatula, remove birds; place 1 in. apart on ungreased baking sheet. Bake 10 to 12 minutes, just until golden. Cool on baking sheet on wire rack 2 minutes, then remove to rack to cool completely. Reroll scraps; cut more birds. Stir 2 cups confectioners' sugar, remaining 1/2 tsp extract and 2 to 3 Tbsp water until smooth. Divide among smaller bowls; tint each to desired color. Spread icing over each cookie. Stir 1 cup confectioners' sugar with about 4 tsp water until thick enough to pipe. Spoon into small ziptop bag; snip off a tiny corner of bag. Pipe designs on a cookie, then immediately sprinkle with sanding sugar. Repeat with other cookies. Let dry at least 12 hours. Tap off excess sugar. 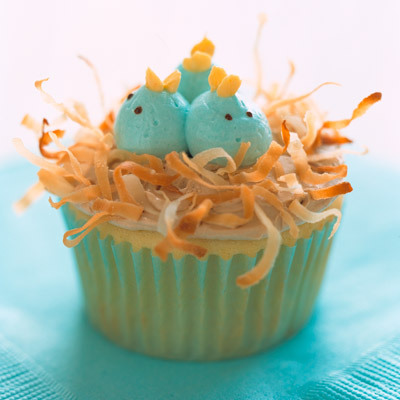 Get into the spirit of spring with a mother hen cake and her adorable cupcake chicks. 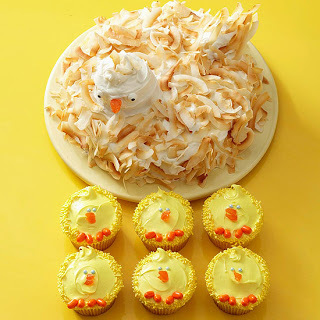 Make a single layer cake for the hen, then use cupcakes to make her head and tail. 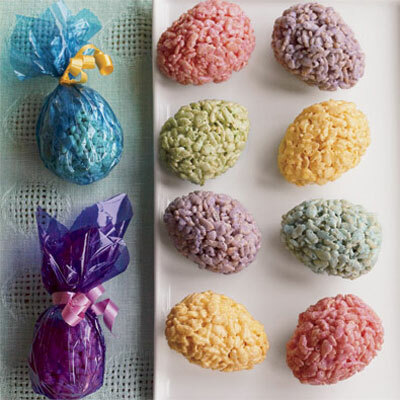 Decorate with homemade vanilla frosting, toasted coconut flakes, and candy pieces for a truly delightful dessert. Directions: Prepare cake mix according to package directions and follow instructions to bake cake in two 8-inch round pans. Remove from pans and let cool completely. Using sharp paring knife, cut one layer into three pieces, as shown in diagram (right). 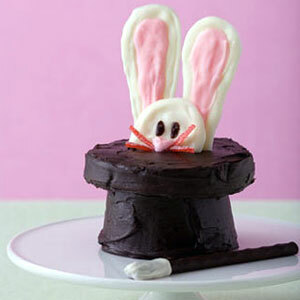 Using a bit of frosting, attach both ears to the top of the round cake and the bow tie to the opposite end. Cover entire cake with frosting, using a lightly swirled pattern. Create the bunny’s face by using jelly beans for the eyes, a Jordan almond for the nose and licorice rope for the whiskers and mouth. Decorate the bow tie with jelly beans in the center and licorice strips on the sides. Adorn the ears with sprinkles or decorating sugar. Directions: Heat oven to 350°F. Double up 24 Reynolds foil egg-shaped baking cups so you have 12 nested cups. Coat with nonstick spray. Place on a rimmed baking sheet. Make Brownies: Prepare brownie mix as directed on box for fudgy brownies. Divide batter among cups (about 3 Tbsp each). Bake 15 to 20 minutes until a toothpick inserted in centers comes out clean. Cool completely on a wire rack. Make Mousse: Heat 1⁄2 cup cream and the sugar in a medium saucepan over medium-low heat, stirring until sugar dissolves. Add chocolate; stir until melted. Scrape into a medium bowl and let cool. Beat remaining 1 cup cream with mixer on high speed until soft peaks form when beaters are lifted. Stir a large dollop into chocolate mixture, then fold in remaining. Remove 3⁄4 cup mousse. Divide among as many small bowls as colors you plan to use. Tint each a color. Spoon into small ziptop bags, press out air, then seal bags. Spoon remaining mousse on brownies (about 2 rounded Tbsp each). Spread to edge. Cut tip off 1 corner of each bag; pipe designs on eggs. Refrigerate at least 1 hour before removing foil to serve. Directions: Prepare cookies: Preheat oven to 350 degrees F. Place cookie dough on a clean countertop and knead in flour until incorporated. (This will help the cookies keep their shape as they bake.) On lightly floured surface, roll out dough to a 1/4-inch thickness. Using a bunny-shaped cookie cutter, cut out as many cookies as possible; reroll trimmings and repeat. Place cookies 1 inch apart on ungreased cookie sheets. Bake 10 to 12 minutes, or until golden around edges. Cool on baking sheet 5 minutes, then remove cookies to wire rack to cool completely. Spread cooled cookies evenly with vanilla frosting. Sprinkle with white sugar crystals or sprinkles, if desired. If you want to give bunnies eyes and noses, tint a small amount of remaining frosting blue and pink with food coloring; transfer to zip-top bags, snip off corners and pipe frosting onto cookies. (You can use store-bought gel decorator icing instead.) If preparing cookies in advance, let frosting dry completely before storing cookies in an airtight container. Cover and refrigerate any remaining frosting (both plain and tinted) to use on cake. Prepare cake as package directs for an 8-inch, 2-layer cake. Cool layers completely as directed. Wrap layers separately in plastic wrap and chill until ready to assemble. Empty tub of vanilla frosting into bowl and tint with yellow food coloring. Place 1 cake layer on a serving platter. Top with about 1/3 cup frosting. Cover with second cake layer; spread about 2/3 cup frosting on top (use the back of a spoon to make decorative swirls). Cover sides of cake with remaining frosting. Use any leftover frosting from cookies to pipe decorations onto cake, if desired. Carefully press about 8 to 12 bunny cookies into sides of cake and place one cookie on top. (Serve any extra cookies on the side.) 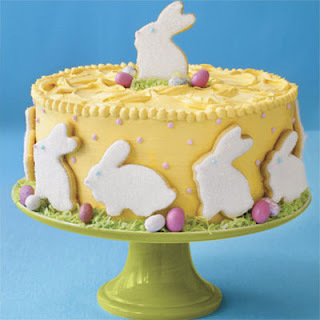 Garnish cake with candy-coated chocolate eggs. To make grass, tint some flaked coconut with green food coloring; sprinkle around base of cake and on top. Directions: Line a baking sheet with nonstick foil. With a toothpick, draw two half-circles about 2 in. in diameter for head and four ear shapes about 2 1/2 to 3 in. onto the foil. Melt white candy melts in microwave as package directs. Dip one end of each chocolate-covered pretzel stick into melted white candy for magician's wand. Place on foil; let set. Place 1 1/2 Tbsp of the melted white candy in a small cup and tint pink. Place both white and pink candy into separate quart-size ziptop freezer bags; snip off small tip from one corner of each bag. On the outline on the foil, pipe in white for head and ears. Use a small spatula to spread. Then on the ears, pipe pink melted candy in Remove liner from cupcakes; invert onto plate. Frost top and sides with chocolate frosting. Frost the cookie on top and sides. Place on top of cupcake. Gently peel head, ears and nose from foil. Make slight cut in top of cookie to insert ears; prop head against ears. Place a little chocolate frosting in ziptop bag; snip off tip. Pipe eyes onto bunny head. Use a little frosting to position nose. Cut sour ropes into thin strips for whiskers; insert into frosting behind nose. Place wand on plate. 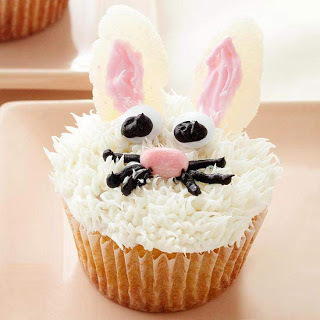 These fun Easter bunny cupcakes are party-ready in minutes. Start with your favorite cupcake recipe, then use a piping bag and star tip to add peaks of vanilla frosting. Shape white gumdrops into triangles for the bunny's ears, give him jelly bean eyes and a nose, and finish him with frosting features. Directions: Preheat oven to 350 degrees F. Spread out coconut on a baking sheet and toast until pale golden, stirring once or twice, 8 to 10 minutes. Cool completely. Line baking sheets with parchment paper. Mix flour, baking powder and salt in a medium bowl. Cream butter and sugar together in a large bowl with an electric mixer until smooth. Add egg, vanilla extract and coconut extract, if using, and beat until smooth. Stir in flour mixture just until incorporated. Shape dough into 1 1/4-inch balls; roll in toasted coconut. Arrange 3 inches apart on prepared baking sheets. With your thumb, make an indentation in center of each ball. Pinch sides of cookies so they stand up and form nests. Bake until golden, 10 to 12 minutes. Cool completely on baking sheets. 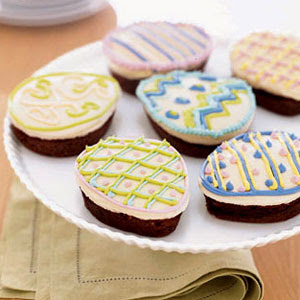 Just before serving, place 2 or 3 chocolate eggs in each cookie. Frost a marshmallow with purchased frosting, then roll it in flaked coconut. 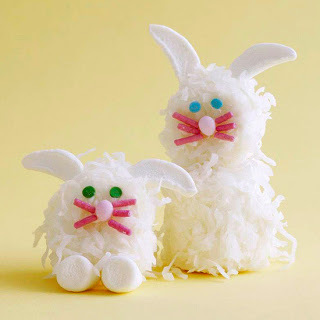 Attach two miniature marshmallows for the feet and decorate with candies for the eyes, nose, and whiskers. For ears, use kitchen shears to cut a strip from the top edge of a large marshmallow, then attach with a bit of frosting.